Whether you’re rushing to work, heading to the gym or embarking on an active adventure, carry your spill-free pokito. Meticulously designed to hold all hot and cold drinks. 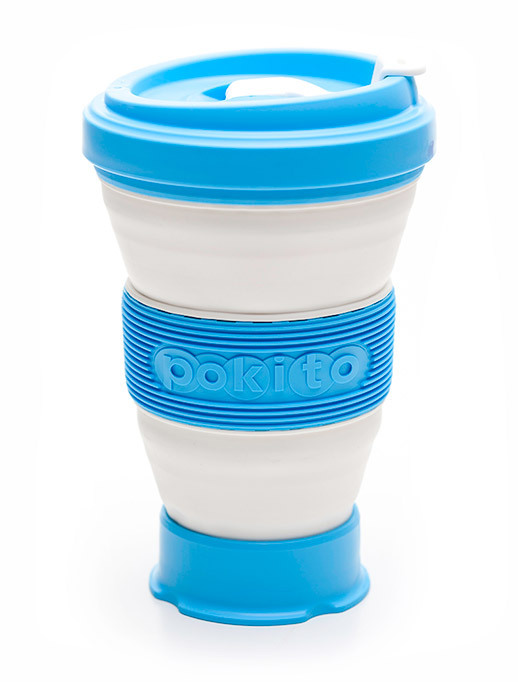 When pokito is empty, just fold it down and slide it into your pocket or bag and carry on with your day without the hassle of carrying around a heavy reusable cup. My problem is losing them! But that’s just me being forgetful. Fantastic product, gets lots of interest especially when I squash it down! It’s pretty leak proof but it does need to be clean and especially the lid, which is probably why it sometimes seems to leak. Would recommend soaking it in Milton to clean it up – white maybe not the best colour for the main body? But here I am buying another, so that speaks louder than words! I’m also definitely going to be trying to work out how I can makes a cup holder for my bike! By the way other similar type products I’ve had have all sploshed a little. Great product and yes such a good idea to reduce the plastic mountain /ocean. So I have two collapsible cups, both designed to accommodate different sized drinks. The other is silicone and has a collar and screw on lid, and came with a silicone straw but that also meant the drinking hole is bigger and tends to leak a bit when drinking and also lets the dregs escape if you have to squish it and put it in your bag. The Pokito is far superior in its ability to stay leak proof. The only way to MAKE it leak is to hold it upside down and squeeze – not a typical action if you have a cup of coffee! The hole for drinking is much better and when finished, it is absolutely leak proof when squished down. My Pokito is now the only one I take when traveling, and the other is consigned to the white elephant drawer. The perfect cup for road warriors. I bought it to stop buying so many non-compostable or recyclable cups, sometimes 4 a day. It’s fantastic. Yes, you have to take a moment and screw the top on carefully, and even then every now and again it leaks/sloshes, however, I think it’s a great product and overall performs far better than paper cups – for very very hot liquids, the hard plastic ring insulates a bit and anyway drinks cool rapidly as silicon is a good heat conductor – so it’s not a thermos style cup! I love how tiny it is once folded, and that it’s a full 16oz when fully extended. It’s easy to rinse and store, and I use it everywhere, all the time. Love my Pokito! It is much better than I expected. As stable as a normal paper cup, if not more so; the lid is good (despite some reviews I have read online); leakproof; and so convenient to carry around. I love the fact you can squash it down and seal the lid when there a few dregs of coffee still in it, and easily take it home to wash – so convenient when you are using it on the go. My local costas now gives you a discount for using your own cup when sitting in – so I am using my Pokito then as well! Just received my Pokito in black and it is fantastic. At last a reusable cup that hopefully drastically reduce the amount of non-recyclable cups into the environment each year. I am that impressed I have ordered three more cups; two in orange and one in lime for my family and friends. I will be ordering more to encourage my friends and family to rethink their drinking habits on-the-go. Now we just need the UK government to introduce the ‘latte levy’ or better still, ban disposal cups. Just great, wonderful design, great idea and fun to use. I am a teacher and the students in my classes are already asking about it! They are raving about it to their families already and I think you’re going to be flooded with orders very soon! Hated the amount of “paper” coffee cups I was throwing away, but I was sceptical about whether I would ever remember to carry a reusable cup especially as I often don’t have a bag with me. Pokito has killed that scepticism! I keep it squashed up next to my wallet and coins and it slips into my jacket pocket with no problem. First time I squashed it up after using I wondered if I should have also carried a plastic bag – but no! Put the lid back on properly and NO LEAKS in your pocket (the tip about backing off the lid a half-turn before screwing down to make sure it fits correctly works for me.) I’m finding coffee shops are increasingly familiar with reusable cups, but some of the baristas are a bit nervous of the Pokito as it is so soft – I have to remember to tell them to hold it by the plastic ring. No problem in getting the reusable discount from the big chains (I only tend to use Costa as they pay UK taxes and treat their staff reasonably decently) which is well on the way to paying for my first Pokito. Had a long conversation about it with the buffet steward on a Virgin East Coast Train who was intrigued by it and pleased to hear that it was made in the north-east of England, which we were travelling through at the time. Only gripe – perhaps make it in a 20oz size? Other than that, I am a huge fan, and have bought three more to make sure I always have one to hand. Thanks very much for your message Richard. Great that you are getting lots of use out of it. We’ve made a note of a larger size cup – follow our social channels for any updates of that kind! I kickstarted these and they are super convenient for travel. I only wish they would make a 20 oz cup and bring back the black cup that they offered as a stretch goal. I got three and use them frequently even though they can take a little while to break in and make a good seal with the lid threads. Was a bit sceptical but got one anyway. Use it every work day now. It packs nicely into my coat pocket and works very well. I rinse it at work after use and it comes up really nicely. It air dries in the day and goes back in the coat pocket at going home time. In addition to getting 25p off at Abocado one gets the warm glow of saving the planet one cup of coffee at a time…! Great product. Great product, love how it just fits in my handbag! Great easy to carry this small cup around. Everyone in the small community I live in in Australia are most impressed so expect many orders. A small way to help the environment. Fantastic product great to help save the environment (well just a little bit!). Well done great to see good British innovation! I love the portability of this cup, and the variable size is genius! Have just tried it while in London, no problems whatsoever with getting discounted hot drinks, brilliant. Like some other reviewers, it can be difficult to get the screw cap on correctly first time. Hi Richard, Thank you for your feedback. Great to hear that you are getting some good discounts! Here is a link to our FAQ’s page, where you can see our instructional video that shows how to get the lid on right each time. Great portable cup. Great colours. Great to support a UK company while helping to save the planet from plastics! I live in the U.S. and could not wait to receive my Pokito! I am using my Pokito everyday and sharing the amazing story of how Pokito came into existence! Thank you, Andrew for this Fabulous Invention and sharing it with the World! I can’t wait till Pokito starts making Cups, like in the 20 oz and larger category! A bit like an exotic pet. Great but takes a while to get to know it, work out to care for it and look after it properly. Don’t give up on it during early teething problems. Hi Keith, I don’t think we’ve ever been called an exotic pet before! I’ll share the link to our FAQs page here, on there you can find a introduction video which has solutions for issues new owners may have, such as seating the lid correctly. Thanks for your comment, the thought an exotic pet-kito has made us smile. Great product – reasonable cost – the way forward. Great product, reasonable price – the way forward. Super happy with my pokito, makes my daily coffee a little more fun! Love it, I work over different sites and often can’t find a clean cup, this just pops into my bag and is with me all the time. I’ve made a small fleece bag to put it in when in my bag to prevent any water/remaining dregs escaping into my bag, and to give it some protection. I and my kids love them. Durable and the ability to squash it down means it fits easily in your bag. Travel a lot for work and so small I don’t mind putting in my plane hand luggage. Just great, couldn’t be happier with it. Very user friendly. Took a couple of goes to pull it out fully but very quickly a dab hand. A couple of people after seeing my cup have said that they will get one. Knowing that my small change of buying a very handy, reuseable, portable cup is helping the environment/the planet and my pocket £ is a great incentive that and feeling a bit smug when you get out your super dooper cup. Let’s all do our bit, what’s not to like. We can’t continue using single use, none recyclable cups. Brilliant idea but mine has become harder to collapse the older it gets and also the white seems to stain a little too easily. I love that its small enough to fit in my handbag and the comments I’ve made will not prevent me recommending it to others as its the best out there at the moment. Hi Pauline, Thank you for your feedback. Have you seen our video on cleaning? It’s on our FAQs page, we’ve found that if they stain they can be rejuvenated by a baking powder paste and a little scrubbing. Love the cup so handy to have in your bag. Will save so much money for me & the environment when coffee tax tax comes into force. Only thing is getting lid on cup as store staff have never seen this type of cup. Thanks Joanne, hopefully all Baristas will be familiar with us soon. In the meantime we do have an instructional video that has some good tips. It’s on our FAQs page! Good for disabled hands. My hands are deformed and very painful due to arthritis so I usually ask for a takeaway cup. Now I just hand over my Pokito. Easy for me to hold and the band in the middle means I don’t burn my hands trying to hold it. Brilliant. Brilliant invention, can only boost the reusable cup economy. All who’ve seen mine are wowed by it. That’s great, we love to make an impact! Thanks for your feedback John. Love love love my pokito. Fits in my bag so can carry with me everywhere. Sturdy. The different sizes in one cup are great. Can’t praise it highly enough. Wow, thanks for taking the time to make that video Annie. It looks great. I love it and my boyfriend, too. We have pokitos everywhere. In the car, caravan, at home and in my purse. The discounts at the cafés make the joy of a good coffee even bigger! Great product, use it every day. Filling it up at home on my way to the office…. The convience of being able to put the Pokito in my handbag is great. I love my Pokito. Its always in my work bag, ready to go and it’s dish washer safe! My family and I absolutely love our Pokito’s – apart from the most important aspect of not using non-recyclable coffee cups that impact so enormously on the environment- they are fantastic to drink from and easy to clean. I always carry mine in my handbag. Excellent item! Use it daily and cutting down on paper/plastic waste with the pokito with take-aways is simple. Easy to fold down and pop in your bag so you don’t forget it too. Great product, you can really take it in your bag without problems and then when you’re home it’s easy to clean (even after 2 weeks, just watch the instruction video). It does not smell and it’s light. And you’re in a happy mood because you won’t have to throw away another paper cup, so it’s the right companion to take to work and cheer up the morning 🙂 I recommend a bright colour! Here’s the link to the instructional cleaning video. It’s a simple technique to get out coffee stains. Great collapsable cup – I can easily leave it in a bag and pull it out at a coffee shop, and the staff love it. Just remember to slowly thread the top evenly, or you can get a little drip. If closed correctly, it’s drip-free. Thank you for the feedback. The pokito has been designed with the needs of baristas in mind, so we’re happy to hear they love it too! Here’s a link to our instructional video which shows how to close the lid correctly. My favourite reusable cup by a country mile. All my others are heavy, bulky and fragile. Pokito is light, durable and convenient to stow when not is use. Means I’ll always have my cup on me when a fancy a coffee on the go! Love it! Perfect for backpacking and travel! Great portability, insulation, grip and seal. A great project to have been part of kickstarting and a real way to help the environment. Excellent product. Good size(s) and easily stashed for transport. It’s great. Fits in my handbag and gets smiles whenever I take it out and pop it into shape. Helps save money and the environment – what’s not to love? It has been the most intelligent purchase I’ve ever made! I simpy love it. It’s easy to carry, easy to use, easy to clean. Just the best! Love my Pokito. Got one for myself and for my husband. Just need to keep remembering to put it in my pocket. These things are absolutely fabulous. Super versatile and very environmentally friendly. Got my Pokito through the kickstarter campaign and am really happy with it. I also get often asked about it since it is so practical that you can just collapse and stuff it into your bag. Sadly, the first pokito I got was leaking like crazy (when drinking even) although there was nothing obviously wrong with it. After contacting the customer service I got a replacement though and now am happy with it. I dont use it every day (and only for tea) but it is especially practical on days full of meetings or lectures when you do not want to use another paper cup for every new beverage you get! Thanks for the feedback. Great to hear you are now getting a lot of use out of your pokito. Most leaking problems are caused by the lid not being put on correctly. Check out our instructional video which shows how to get it right every time. Excellent. I carry mine around all the time, it’s very handy for a coffee from home when I go out, then collapse it up, then use it on the return trip. I always have my cup in my bag, in fact I have two and have given some as gifts. Its size when collapsed makes it so much more convenient than rigid reusable cups. Convenient and portable. Kept it in my bag everyday and it goes everywhere with me..for just in case situation. Really great reusable, and importantly, collapsable cup. Looks great and works well! A great practical product which doesn’t take up much space in my bag & also helps to cut down on environmental waste. In the world where we live in, everyone should think about the environment and have a device such as this one. Besides, it fits nearly everywhere and is very well thought. Unlike most, on the contrary, I myself do have leaking problems with it from time to time, so I dry it up before storing it. Thanks for your feedback, we agree, everyone should have a reusable! Take a look at our instructional video for advice on how to stop leaking. Normally this is caused be the lid being incorrectly seated which is easily fixable with the right technique. Give it a go and let us know how you get on! It never gets old. Innovation in design, durability and space variation is it’s topmost advantage. And last but not least I love my Pokito’s. Really useful. And a great way to cut down the use of disposable cups. I have 2 and I have given a few away as gifts. Simply I love them. Easy to carry and use. Disassembles easy for cleaning too. Get lots of compliments from the baristas as they can also see the volume marks inside so can be sure of correct volume. It’s a great little cup. The only thing is that if you hand wash, you need to dismantle it completely to make sure that the washing liquid doesn’t get stuck between the cup and the hard plastic portions, and that it dries out completely. Hi Kenneth, Thanks for your feedback! Here’s a link to a pokito video that shows how to disassemble and reassemble all of the parts of the pokito. It can be my cup and little bowl. I really love it! Great little cup to easily bring around and clean. I love my Pokito. I love that I can throw it in my handbag and use it whenever I get a cup of coffee, therefore saving the environment. I love that I can change sizes depending on how much coffee I want. I love that I can get it in my favourite colour. I love the talking point that it is when I take it to a new coffee shop. Great cup, extremely portable, light weight and easy to clean. Would definitely recommend. I adore my pokito, I use it for other drinks too, it’s so versatile and easy to carry with me all the time!! LOVE IT!!! Love it. So easy to use and carry. Unfortunately the cream part had discolored inside fairly quickly, and I have a habit of squeezing the soft part of the cup when drinking and causing it to leak/spill – retraining myself to hold the cup differently will prevent this in future. Thanks for your feedback! We’re happy you love using it. The best thing to do is to hold onto the insulated center band, this stops compression of the cup and keeps your fingers from getting too hot. We recommend rinsing out after each use to stop stains building up. If you do get some have a look at our videos about how to deep clean your pokito and one more about how to remove stains. Looks good, works well, small enough to keep in my work bag. It’s surprisingly stable even though the main cup is flexible enough to fold. Received two pokitos from Kickstarter. As a barista, I get amazing compliments at work. Very reliable and efficient! The thing I like best about the Pokito is it weighs next to nothing and when collapsed it fits easily in my jacket pocket so I always have it with me. A great product! I love mine. I always keep on in my purse and another in my work bag or car. It’s perfect. So extremely useful. Mum and I both use ours a lot and I have bought some for friends as Christmas gifts. Small but large when needed, then small again to fit in bag! We have really enjoyed our pokitos. I keep mine in my purse and another in my travel bag so they are always handy. Love my Pokito! So compact and easy to carry and use! Great product. I used to leave a mug at work so I didn’t have to use disposables. I would always find people using it. Now I can pack my cup away in my lunch bag, nice and safe. I love the colors and the fact that I can just throw it in my bag and go or keep one in the glove box of the car.So glad I found it on Kickstarter. I personally have 2 , right now. Bought it specifically for camping trips but use it more than that. I LOVE Pokito! I never forget my cup anymore as it’s always with me in my handbag. I love that I only have to carry one cup but can have any size I like. Terrific product. I sometimes get too aggressive twisting the cap on. Doesn’t need it if it’s threaded right. Just perfect for a drink on the go and makes me feel better about our fragile world! Very handy, durable and flexible, but mine doesn’t seal completely, so I have to keep it in a plastic bag after use to avoid spilling. Hi Alfred, We’re really glad you are getting lots of use from your pokito! We recommend emptying the last liquid out of the cup before putting in your bag. With just a small amount of dregs and the lid fitted correctly there should not be any spillages. Check out our FAQ’s page for more info. I LOVE that I can easily order any size of beverage and then smush my cup into a convenient small puck to tuck anywhere when I don’t need it – eliminates excuses for not using a reusable cup always! Also the silicone is great – I can drink anything out of it without everything tasting like coffee! My only complaints – it doesn’t keep your hot drinks hot long (not really a problem for me – I drink them quickly!) and sweats a lot with iced beverages because there’s no insulation and you have to be sure you put the lid on just right to avoid leakage. Very convenient, more so in winter with bulky coat pockets to store it. Agree with all the reviews here. I must admit to feeling quite smug and proud of myself when presenting my cup at coffee counters and getting enquiring looks and comments. I’m doing my bit for the environment! Super for on the go coffee. Love giving it to baristas and seeing their faces when it unfolds! Send us your photos of that on Facebook. We always enjoy seeing that too! I use my pokito at least once daily. My mom loves hers, too! I adore my pokito. It lives in my handbag and goes everywhere with me. It’s light enough to carry around, but sturdy enough that I don’t have to worry about leaking or spillage when it’s full. It’s also nice to know that I’m doing that little bit to reduce waste and help the environment. Great idea and works well – my husband likes his as he can claim a discount at coffee chains! Thanks for mentioning this as not everyone knows that Costa, Starbucks & Pret and some independents offer discounts when you take in your reusable cups. Just one more reason to pop your pokito in your bag when you head out! So easy to take along wherever you may go! Great for commuting, where you can simply collapse the cup and put it in your bag. Thank you for making such a wonderful and eco-friendly product. I always show off my Pokito mug everywhere I go! I gave all of mine as gifts, not having the sense to get one for myself! My friends tell me that they particularly like the portability and reliability of their cups, as well as the entertainment value of shifting the cup to the appropriate size after they order. The portability factor alone is enough to recommend pokito, but with the great color options and low environmental impact make it a pleasure to rave about Pokito. the one issue I have is getting the lid on correctly each time. I hope this is something the will be improved upon on in future versions. Thanks for your feedback and we are really glad you enjoy using your pokito. We have found that some people have found the lid tricky to use when they first receive their cup. It’s not that difficult, you just need to be a little careful and get into the right habit! For a demonstration of how to get the lid on perfectly every time take a look at our instructional video on Youtube. Greatest cup. That’s all. No need to add a word. Very convenient, great quality and fun choices of colours. Highly recommended. Love that I can carry it around in my coat pocket and pop it open when I need a caffeine fix. When empty, it disappears back into my pocket. Great and easy to use. Ir reduces non-recyclable coffee cup waste! I like the blackberry colour better because it doesn’t show wear and tear from my pocket or purse. But it’s always with me! Great little cup – stays in my travel bag so I always have it. Very convenient cup. Easy to fold/unfold. Easy to disassemble for cleaning. Clean the cup in time! When you forget for a few days it will be very difficult to clean. Perfect cup for traveling by car, train, or plane. Easy to shrink its size and have with you. Just make sure you put the cap on correctly. Love the portability. Keep one in the car. I am the prowd owner of two pokitos (+gifted another 3). One lives in my bag at all times with a backup one at home for a friend to borrow it or when the first is in the dishwasher. They make avoiding disposable cups effortless. Thank you pokito makers! Guilty pleasure: being asked where I bought my awesome cup as I take the compressed cup out of my bag at coffee shops! Need 2. Cannot use same cup for.both coffee and tea, otherwise tea has coffee undertaste. Would love to be able to have cup larger than 16 oz! Love my Pokito, great for travel too! Hi Amy, Thank you for your feedback. We’ve found that if you like a strong coffee it’s best to rinse out as soon as possible after drinking. If that’s not possible you can use a baking powder paste to give it a scrub and get any residue out. We have made a video to show how to do this, it’s on our FAQ’s page. Of course having two also works! I love my Pokito! Easy to carry, use, and clean, and the different sizes means it’s easier for the barista, too. The best part is knowing I’m generating less trash with my reusable cup! A very good product— strong, light-weight, flexible. Just not quite as leak-proof as I hoped. Thank you for your feedback. We are a spill proof cup, rather than leak proof. We certainly don’t recommend putting one full into your bag. But for on the go coffee we fit the bill. Once you’re done, empty out the dregs, collapse down, pop the lid on securely and put away in your bag – maximum portability and one disposable cup saved! Check out our user guide videos on our FAQs page for more info. Very convenient and portable; a great idea well-executed. It is easily stained with daily use, though, and beware…you must put on the top carefully lest you spill your beverage on your shirt (we jokingly call our cups “leak-ito”)! Hi MT, Here’s the link to our FAQ page where you will find videos about how to clean off stains. We recommend rinsing after every use and then, when necessary, using a baking soda solution to soak and scrub off any stains. Putting the top on carefully is the right thing to do, as cross threading is the main cause of any spills, once you have the knack this rarely happens! It’s great to hear that you are using your pokito every day, thanks very much for the feedback. This is a great environmentally friendly product! It is fantastically portable – it folds down to virtually nothing so fits easily in a bag. I just keep mine there in case I want a cup of tea when I am out. I have had several people compliment my pokito cup. They look pretty snazzy and are a great idea for helping reduce waste from disposable cups. Great product, compact & versatile, helping to reduce detritus. Easy to use, easy to carry. After drink is finished, flatten and pocket it. Part of our regular camping kit now. Great Product love the size fits perfectly in my golf bag and brief case. Camping, work, shopping, and international Travelling, My Pockito has been Everywhere… Love the portability and convenience of this great invention…has made having my coffee much more convenient and Helped Save Our Environment,”One Cup at a Time.”!! Supported the company from the beginning. Love the cups, we have 8 in our household alone. I always have one in my bag ready to use. I love my Pokito and take it with me everywhere! Fits perfectly in my purse. Gets admiring comments from baristas! Great product! I love the flexibility with sizes and the portability. Easy to use. Easy to clean. Takes up no space. Always convenient and ready to use. I bought my Pokito back when it was a Kickstarter project. I love how small it can be made and I’ve saved a ridiculous amount of money from not using the cups in a high street chains and using this instead. Love it, used every day several times, often admired by others, who ask the details. Well Recommended. Love the way it collapses down. I love this cup. I’m a new first time mom who has developed a necessary coffee habit. Since we are often on the go, it is so wonderful to have a cup I can fit in my jacket pocket or diaper bag. It has also taken a few tumbles with a drink inside and DID NOT LEAK! It is also fantastic for warming up bottles or baby food when on the go! Love the colors, G’ma doesn’t drink my coffee any more! I keep one in my bag for water at fast food places, and great for camping. I always take mine to meetings and conferences. People are always so jealous when I have a lovely big cup of tea in my pokito and they’re stuck with the titchy little cups you get at conferences! I don’t think I can use any other cups anymore. A cup I can take and place anywhere like my pocket, bag, etc. Hi Sarah, Thanks for your feedback! There are a few techniques that can help to get the lid on right, we have made an instructional video to show them. Check it out on our FAQ’s page. Let us know how you get on. It is the best darn travel mug to ever enter our family’s travels. We’re 4 that use them daily. Never fail! Best cup I have ever owned. Super convenient, practical and is the envy of all my friends. Excellent product, fantastic quality and amazing design. Great product, fits neatly into my laptop bag or pocket for easy access. I absolutely love my pokito in that it has become a daily necessity. Initially found problem with leakage,but after experimenting on the correct positioning of the the groves of the cup and the cap,have now becoming an expert. Sdo much do that I can’t do without my pokito . Fantastic product. Easy to use. The difference size options are great for different coffee choices. It’s so compact in my bag. I highly recommend it from one coffee lover to another. One of the best things I have bought in years – light, folds down, environmentally friendly, saves money – just brilliant!! Perfect for your handbag: I use mine daily, as part of me trying to do my small bit against unnecessary landfill and non-recyclable waste. I’ve given to friends & family as a gift and they love theirs as much as I love mine. So practical, saves space when carrying and saves the environment too! The multi-format possibilities are great! Sehr praktisch und nachhaltig! Trotz gemischter Nutzung mit Kaffee und Tee kleine bleibenden Gerüche oder Aromen. Absolutely love the Pokito. I carry one in my bag all the time. It’s so useful and I love that it’s environmental friendly and it looks good too! I’ve gifted a couple of Pokitos to my friends and they really like it. Hoping to see more people using them. As one of the people who supported Pokito on Kickstarter, I was really pleased when the actuality lived up to its promise. I always have one in my bag, as do my three adults kids, and it’s so handy, as well as doing one’s little bit towards saving the environment. Just remember to push the top flap in around its middle area until it clicks , as well as closing the flap. I didn’t do this at first and wondered why my cup was leaking. It’s great too that one can change the size of the cup for different drinks – so handy. I like my Pokitos – I have two and change the colour according to my mood (I know, I’m a sad person!). Love the fact it can fit in my handbag the downside is cleaning it between drinks on the move. Will do what it takes to save the non recyclable disposables. Love the cup so compact and easy to use . Fit in my work bag perfectly. Great product. I keep it in my laptop bag so I can grab a coffee on my way to my desk every morning. Very easy to adjust the sizes and it doesn’t leak unlike a lot of other coffee containers I have tried. It folds and reuses well. The white stains quite easily, but you can scrub it well enough. No warp has occurred with several dishwasher washings. HOWEVER, I find it very difficult to properly screw on the lid. I use travel mugs all the time to prevent myself from scalding myself with hot coffee, but this often ends up leaking through the screwed on portion. I don’t notice until I end up lightly squeezing the cup – then I have small drips come down the side. This is a daily occurrence, even with me paying careful attention to how I screw on the lid. I was a ks backer, so this was slightly disappointing. Hi Taylor, We’re really glad you are getting lots of use out of your pokito. Here’s a link to our FAQ’s page where you will find a video that shows the best way to do up the lid. It’s best to hold the cup by the insulated middle section rather than the white cup which should help to stop the cup becoming compressed. Thanks very much for your feedback! Really useful, especially that it collapses so you can fit it in a pocket. My contribution to our environment. Not much effort but lots of paper cups saved. It is a great convenient product that I keep in my backpack and use all the time. As a Kickstarter backer I am proud to have supported the product from inception to completion.